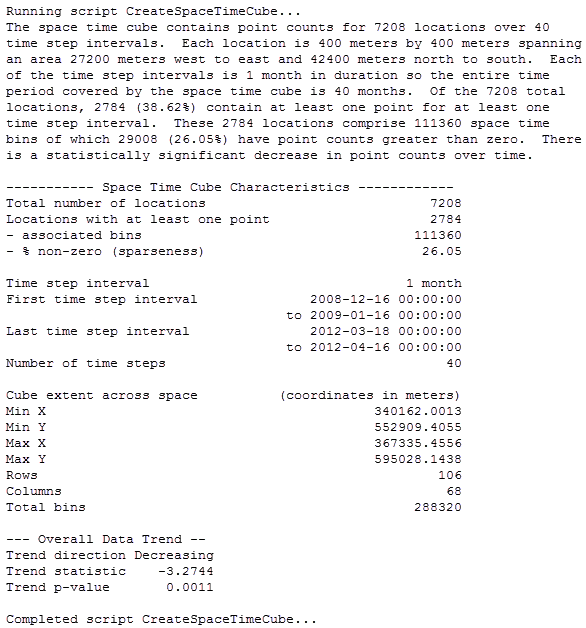 The Create Space Time Cube tool takes timestamped point features and structures them into a netCDF data cube by aggregating the points into space-time bins. Within each bin the points are counted and the trend for bin values across time at each location is measured using the Mann-Kendall statistic. You would most likely use this tool to create the input cube needed for further space-time pattern mining, but you could also use it to examine time-series trends across your study area. Output from this tool is a netCDF representation of your input points. 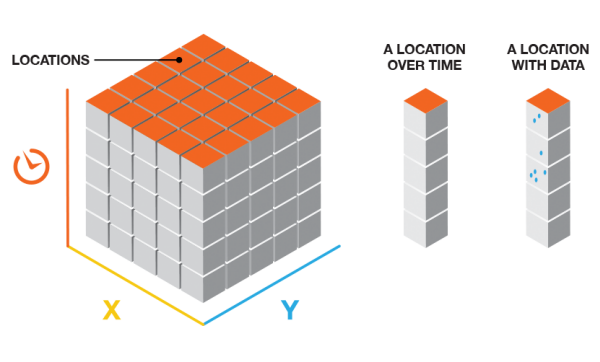 You may visualize the cube point count data in either 2D or 3D using ArcGIS Pro. In addition to the netCDF file, messages summarizing the space-time cube dimensions and contents are written to the Results window. Right-clicking on the Messages entry in the Results window and selecting View will display the results in a Message dialog box. The cube structure will have rows, columns, and time steps. If you multiply the number of rows by the number of columns by the number of time steps, you will obtain the total number of bins in the cube. The rows and columns determine the spatial extent of the cube, while the time steps determine the temporal extent. Locations with data are places (bins in the spatial dimension) within the extent where at least one point has occurred over time. For most analyses, only locations with data for at least one time-step interval will be included in the analysis, but they will be analyzed across all time steps. Zero counts are assumed for any bin where there are no points, but the associated location has had at least one point for at least one time-step interval. Information about the percentage of zeros associated with locations that have data for a least one time-step interval is reported in the messages as sparseness. Notice that, at the end of the message output, there is information about the Overall Data Trend. This trend is based on an aspatial time-series analysis. The question it answers is, overall, are the events represented by the input points increasing or decreasing over time? To obtain the answer, the number of points for all locations in each time-step interval is analyzed as a time series of count values using the Mann-Kendall statistic. In most cases you will know how to define the cube bin dimensions, and the strong recommendation is that you think about what the appropriate dimensions should be for the particular questions you are trying to answer. If you are looking at crime events, for example, you may decide to aggregate points into 400-meter or 0.25-mile bins because that is your city block size. If you have data covering an entire year, you might decide to look at trends in terms of monthly or weekly event aggregation. In the rare case where you do not have strong justification for any particular time-step interval or distance interval, you can leave the Time Step Interval or Distance Interval parameter blank and let the tool calculate default values for you. Determine the distance of the longest side of the Input Features extent (maximum extent). The bin distance is then the larger of either the maximum extent divided by 100 or an algorithm based on the spatial distribution of the Input Features. The default time-step interval is based on two different algorithms used to determine the optimal number and width of time-step intervals. The minimum numeric result from these algorithms, larger than ten, is used for the default number of time-step intervals. When both numeric results are less than ten, ten becomes the default number of time-step intervals. The Time Step Alignment is an important parameter to think about when aggregating your data into a space-time cube, because it determines where the aggregation will begin and end. Let's take a look at an example. The illustration above represents a dataset spanning from March 25, 2014 to April 12, 2014. We'll use this dataset to explore the implications of the different parameter options. If an End time Time Step Alignment is chosen with a Time Step Interval of 3 days, for instance, the binning will initiate with the last data point and go back in 3 day increments until all data points fall within a time step. It is important to note that, depending on the Time Step Interval that you choose, it is possible to create a time step at the beginning of the space-time cube that does not have data across the entire span of time. In the example above, you'll notice that 3/23 and 3/24 are included in the first time step even though no data exists until 3/25. These empty days are part of the time step, but have no data associated with them. This can bias your results because it will appear that the temporally biased time step has significantly less points than other time steps, which is in fact an artificial result of the aggregation scheme. The report indicates whether there is temporal bias in the first or last time step. In this case, 2 out of the 3 days in the first time step have no data, so the temporal bias would be 66%. 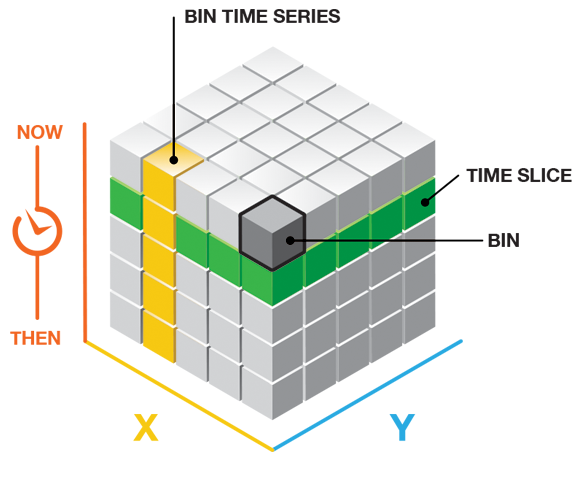 End time is the default option for Time Step Alignment because many analyses are focused on what has happened most recently, so putting this bias towards the beginning of the cube is preferable. Another solution, which gets rid of the temporal bias all together, would be to provide data that is broken evenly by the Time Step Interval so that no time periods are biased. You can do this by creating a selection set of the data and cutting off the part of the point dataset that falls outside of what you would like to be the first time period. In this example, selecting all data except for those that fall before 3/26 would solve the problem. The report shows the time span of the first and last time steps, and that information can be used to determine where to make the cutoff. It is also important to note that if, in the process of moving back in time, the final bin happened to land exactly on the first data point as its start, that final data point would not be included in that bin. This is because with an End time Time Step Alignment each bin includes the last date in a given bin, yet goes back to but does not include the first date in that bin. So, in this case an additional bin would have to be added to ensure that the first data point was included. If a Start time Time Step Alignment is chosen, with a Time Step Interval of 3 days, for instance, then binning will start at the first data point and go in 3 day increments until the last data point falls within the final time step. There are a few things that are important to note. One is that with a Start time Time Step Alignment, based on the Time Step Interval that you choose, it is possible to create a time step at the end of the space-time cube that does not have data across the entire span of time. In the example above, you'll notice that 4/13 and 4/14 are included in the last time step even though no data exists after 4/12. These empty days are part of the time step, but have no data associated with them. This can bias your results because it will appear that the temporally biased time step has significantly less points than other time steps, which is in fact an artificial result of the aggregation scheme. The report indicates whether there is temporal bias in the first or last time step. In this case, 2 out of the 3 days in the last time step have no data, so the temporal bias would be 66%. This is particularly problematic when choosing a Start time Time Step Alignment because analyses that are focused on the most recent data can be significantly impacted. The solution would be to provide data that is broken evenly by the Time Step Interval so that no time periods are biased. You can do this by creating a selection set of the data and cutting off the part of the point dataset that falls outside of what you would like to be the last time period. In this example, selecting all data except for those that fall after 4/11 would solve the problem. The report shows the time span of the first and last time steps, and that information can be used to determine where to make the cutoff. It is also important to note that if, in the process of moving forward in time, the final time step happened to land exactly on the last data point as its end, that final data point would not be included in that bin. This is because with a Start time Time Step Alignment each bin includes the first date in a given bin, yet goes forward to but does not include the last date in that bin. So, in this case an additional bin would have to be added to ensure that the last data point was included. AReference time Time Step Alignment allows you to ensure that a specific date marks the beginning or end of one of the time steps in the cube. When you choose a Reference time that falls after the extent of the dataset, at the last data point, or in the middle of the dataset, it will be treated as the last data point of a time step and all other bins on either side will be created using an End time Time Step Alignment until all of the data is covered, as illustrated below. 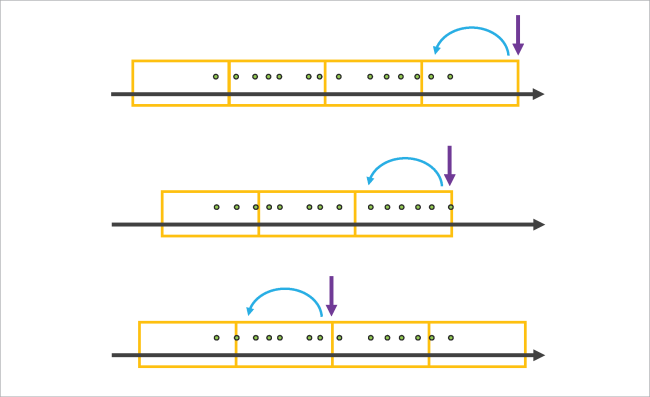 When you choose a Reference time that falls before the extent of the dataset or at the first data point, it will be treated as the first data point of a time step and all other time steps on either side will be created using a Start time Time Step Alignment until all of the data is covered, as illustrated below. 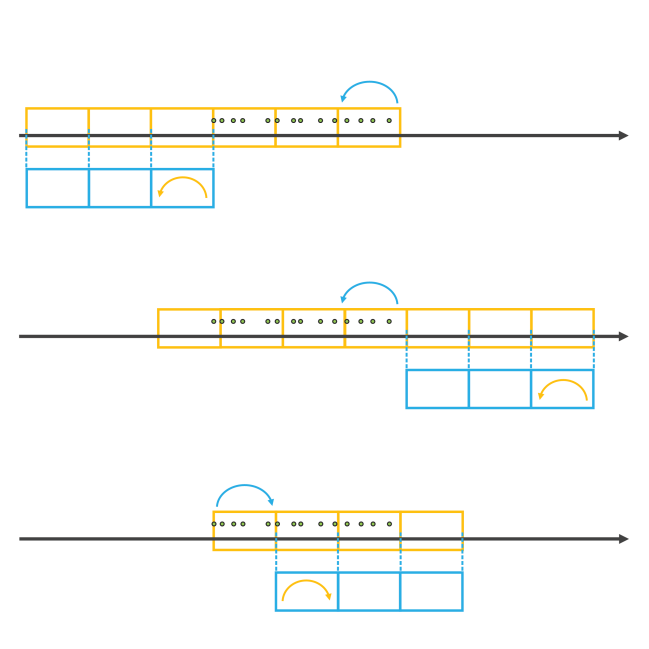 Choosing a Template Cube has implications for the Time Step Alignment. Let's take a look at a few examples. When you choose a Template Cube that falls before or after the time span of the Input Features, time steps will be added until all of the data is covered by a time step, using the Time Step Alignment of the Template Cube. The resulting space-time cube will have empty cubes wherever the Template Cube did not overlap the Input Features in time. This can bias the results of analysis. If the Template Cubeoverlaps the Input Features, the resulting space-time cube will cover the temporal extent of the Template Cube and extend until allInput Features are covered, using the Time Step Alignment of the Template Cube. The illustration below shows Template Cubes in blue, and the resulting space-time cubes in orange.